For some people, Astrology means nothing, and it never even enters their minds as a possible influencer of the events in their lives. For others, Astrology can not only predict events, but also help to explain (the why of) what has happened to someone in the past. While there are vastly different interpretations within the field(s) of Astrology, there is an underlying connection that runs through all the variations...you either believe in Astrology, or you don't. The sites listed in this area hope to bring together believers in Astrology, whether it be for friendship or for romance. When possible, we have outlined the specific focus of individual sites, and detailed whether they are more of a dating site, a matchmaking site, or they are just trying to connect believers to those who provide readings. 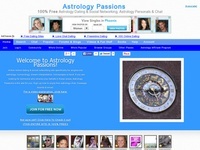 Astrology Passions is a free dating site for singles with an interest in Astrology. Join for free and take advantage of free email, chat, forums and more. While not a dating site, this is a good place to look for a variety of online horoscopes and Astrology related products. Find your compatibility level with people. Free access to a number of different approaches for determining compatibility, including methods used by many professional Chinese fortune-tellers today, as well as other methods. "Astro-MatchMaker is the most accurate astrological dating service online. We use proven astrological techniques to match individuals who are compatible and physically attractive to each other-all the right ingredients for true love and romance. Match reports are reviewed by live astrologers!